REDMOND, Indian Ocean, Tuesday — Microsoft has announced that today is “Global Anti-Piracy Day,” with the aim to raise awareness of the damage to software innovation caused by robbery and murder on the high seas. Piracy off the coast of Somalia has made these the most dangerous waters for software development in the world. 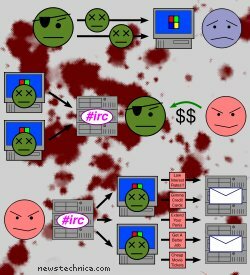 The pirates use hacked zombie PCs, sometimes impounding codebases and programming staff at the point of their Heckler & Koch MP3s and demanding warez before they are released. A famous attack late last year against one open source operating system was foiled when the crew scared the pirates off with the Righteous Mathematical Stentor, an ear-splitting acoustic device developed in Massachusetts as a “non-lethal” free software advocacy weapon. Somali clan leaders have agreed to end over two decades of Unix wars in the country and have made attempts to address the piracy problem. But the tremendous lawlessness off the long eastern Somali coastline reflects the difficulty of controlling the flow of information on the Internet. I think M$ is safe. Not even the pirates wants Vista!